We are pleased to announce that our Downtown New York showroom team have teamed up with esteemed interior designer, Wesley Moon, to create the stunning centrepiece for his display in the third annual Holiday House Hamptons. As a designer for the event, Wesley chose our Lotti headboard, upholstered in Foglizzo leather to compliment the stunning ambiance of the space he created. 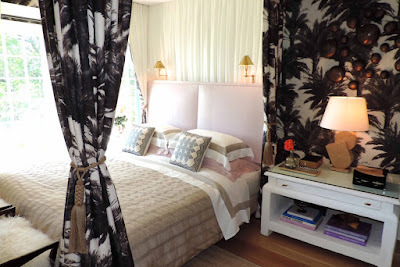 The doubled-panelled bed was further enhanced by beautiful draping in fabric from La Maison Pierre Frey. Celebrating the best in interior design and holiday entertaining while supporting the fight against breast cancer, the Holiday House event benefits The Breast Cancer Research Foundation®, which was founded by Evelyn Lauder in 1993 and works tirelessly towards achieving prevention and a cure for breast cancer by providing critical funding for innovative clinical research at leading medical centers worldwide, and increasing public awareness about good breast health. The event will run from June 19-July 26, 2016. Visit the room featuring the Savoir Lotti bed at 100 Crescent Ave. Water Mill, NY 11976. Image credits: Wesley Moon, Rio Hamilton @ Savoir Beds Soho. For the purpose of spending vacation in this place it’s so incredible for me. I will prefer to visit there for spending my vacation. The Hamptons in general are the towns (called townships in some states) of Southampton and East Hampton on the south shore of Long Island.Recently i visited their with my team of Cafe Racer Jacket. It was great experience for me.